Back in the Fall, I made a little getaway to a familiar area (no, I won’t use that word that begins with “stay” and ends with “-tion”). 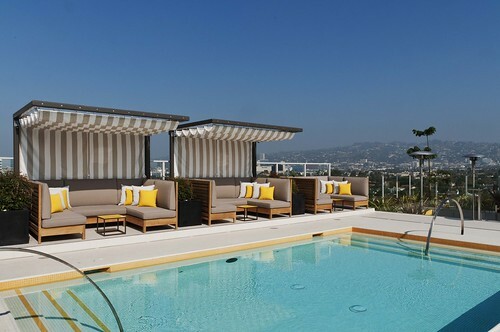 It was a welcome chance to really explore what I already thought I knew, and the Hotel Wilshire was the perfect home base. 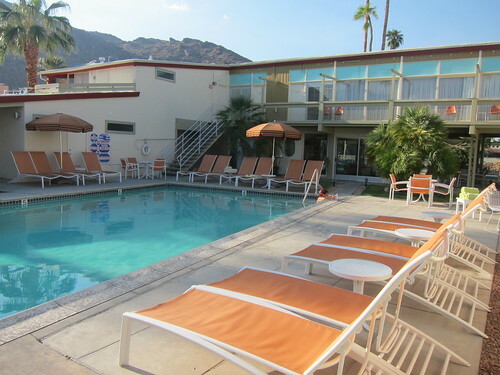 The Hotel Wilshire is walking distance to LACMA, but also to Petersen Automotive Museum. Both museums are the venues of so many cultural events, which makes the hotel seem like a great place for out-of-town visitors to establish their base or for locals to crash after a nearby gala. The rotating exhibits make it perfect for locals to visit time and time again. I grew up with a particular older brother who had all of the James Bond flicks (half on Beta, half on VHS), so I had enough exposure to the British spy series to pick the cues up quite a few years later. 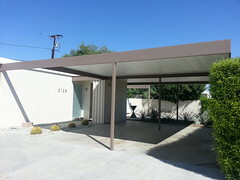 Just recently, it re-started with my viewing of the Mad Men Season 5 finale. That Peggy and Don viewed Casino Royale while playing hooky from work and the finale’s credits closed out with You Only Live Twice made me take notice of everything going on around us. My girlfriend, who volunteers at The Aero, mentioned their Bond marathon. The James Bond frenzy is currently overtaking Los Angeles. American Cinematheque’s The Aero Theatre (Santa Monica) is concluding their Complete James Bond Retrospective this weekend with Golden Eye and Tomorrow Never Dies on Friday, June 22nd and Casino Royale and Quantum of Solace on Sunday, June 24th. The Egyptian (Hollywood) will be screening The World Is Not Enough and Die Another day on Saturday, the 23rd. But it’s not really celebrating Bond if you don’t toast his tradition of drinking, or concocting, the classics. 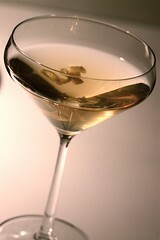 Lo and behold – today is also National Martini Day! But if you’re like me, you already know which places really know how to make a martini just how you like it. So let’s mix things up with some help from the spy. After a screening or exhibit viewing at LACMA, head on over to the adjacent Ray’s & Stark Bar, the bar of which is helmed by Paul Sanguinetti, where you can order a Cali Blonde (think Eva Green with a dye job). It’s essentially a Vesper made with Hangar One vodka, Martin Millers gin, Lillet Blanc and lemon peel. Here with the Reverse, the vodka and gin proportions are switched because after all, 007 gravitated more towards vodka further along his career. Take things to the next level with a barrel-aged cocktail tribute to author Ian Fleming called The Living Daylights over at The Spare Room inside Hollywood’s Roosevelt Hotel. But we mustn’t forget the Classic Daquiri at Steve & Pablo’s La Descarga, which always come out superb. Again, here we’re waxing Fleming’s glamorous time in the Caribbean. Kenny Arbuckle will have you covered and it is always a fantastic time with plenty of live music and great tunes. If you want rum neat – and why wouldn’t you? – don’t miss the sipping bar in the cigar lounge out back. There are specialty rums that make limited appearances but always leave you craving more. Viva la Bond and Happy National (modified) Martini Day! I’m definitely grabbing a Vesper or something else Bond-inspired after work. Enjoy you and yours! I’ve always been a fan of Stark Bar. What’s not to love? 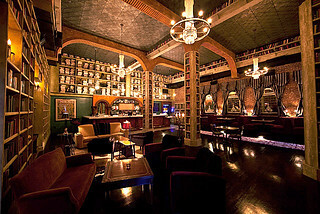 Great cocktails made with fresh ingredients and spectacular, savory bar bites are yours to enjoy within one of the most cosmopolitan confines in Los Angeles. Ray’s and Stark Bar bring purpose and focus to LACMA‘s outdoor scene. 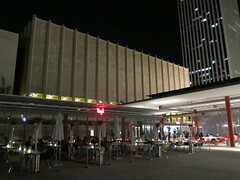 It’s the stalwart at the center of a free-flowing patio in which the art is in the food and cocktails – a scene I’m readily available to insert myself into as I’m a new LACMA member! But I wasn’t completely sure how much of my favor for Stark Bar would translate to the dining room at Ray’s (or if any of it would). Well into the second course of our media dinner party, it became clear that all those Stark Bar’s bar bites I’ve become familiar with really are a mere introduction to the depth of Kris Morningstar’s cooking. There were some amazing flavors to be had from one course to the next. It’s easy to see why Ray’s and Stark Bar are one of the representative Best New Restaurants in Esquire Magazine’s recently published 2012 list. It’s no detail that the cocktails, by Michel Dozois, were a delight. The ones served (the names of which I irresponsibly didn’t record) were refreshing and particularly complementary to the dinner. 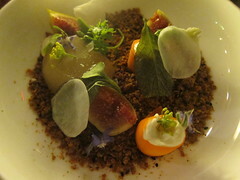 As was a theme during the meal, Kris masterfully integrated hisÂ garden ingredients into the original design of his dishes. We have all had an heirloom tomato salad, but I was floored by his version, which came topped with charred local squid, shiso and Bottarga vinaigrette.Â The Granola, aÂ wholly imaginative dish in itself (who serves granola for dinner? ), had such complexities that each bite made for an evolutionary taleÂ til the very last spoonful. 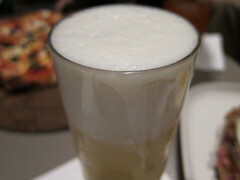 It was refreshing, yet savory, yet sweet and herbal…you will just have to try it before the end of the season, yourself. 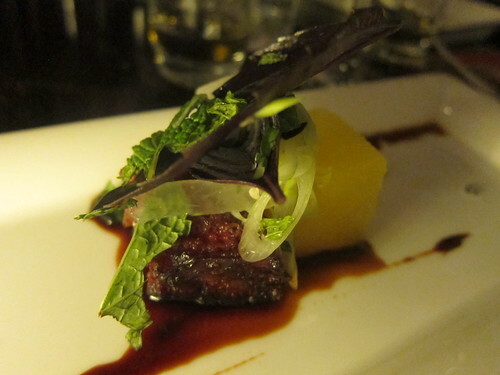 TheÂ Pork Belly was a crispy, deliciousÂ slice, as coupled with a sweet cube of golden watermelon. The black vinegar and basil brought everything together while delicatelyÂ balancing out the sweetness of the other two. The Sonoma Lamb was a savory masterpieceÂ and tender asÂ as can beÂ with Butter beans, corno di toro peppers, baby artichokes, oregano and rouille – more evocative of the bar menu I’ve become accustomed with. 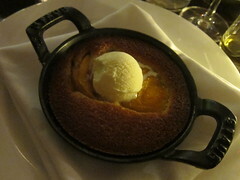 The dessert, which was a sweet and savory delight cooked and packaged in an iron skillet, was such a nice nightcap. It wasÂ the perfect amount of sweet with just enough savory breading, and I devoured every inch. With Ray’s, it’s apparent thatÂ museum restaurants in Los Angeles have finallyÂ moved beyond the obligatory watering hole and feeding quartersÂ for art patrons. Instead, the space has itselfÂ become a viable destination for those looking for solid cocktails and bar bites or, what’s more, an inspirational meal.Â Since thisÂ makes for an overallÂ exciting time to be at LA’s representative art institution, it really is something all Angelenos can be proud of. All food, wine and cocktails were hosted. It may be commonplace for a museum to have a gift shop and furthermore, a restaurant, available within its walls for the convenience of its guests. 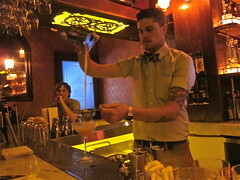 The quality of Ray’s and Stark Bar, however, serves to make it a viable rival as far as being a destination in itself. Upon approach, the beautiful but complementary decor and setting of Ray’s and Stark Bar (so-named after the late film producer and former LACMA Trustee) expertly enable the restaurant and bar to blend in with its surroundings on the museum’s middle patio. But nothing about it dwindles in comparison to even the largest campus of the largest art museum in the western United States. Certainly not the food menu, curated by Kris Morningstar (District), and certainly not the cocktail selection – which currently runs 25 deep – by Michel Dozois (Neve Ice). The treats are just as savory as what you’ve found on Chef Morningstar’s menus past – thank god – and at first taste during a media cocktail party, just as delicious. 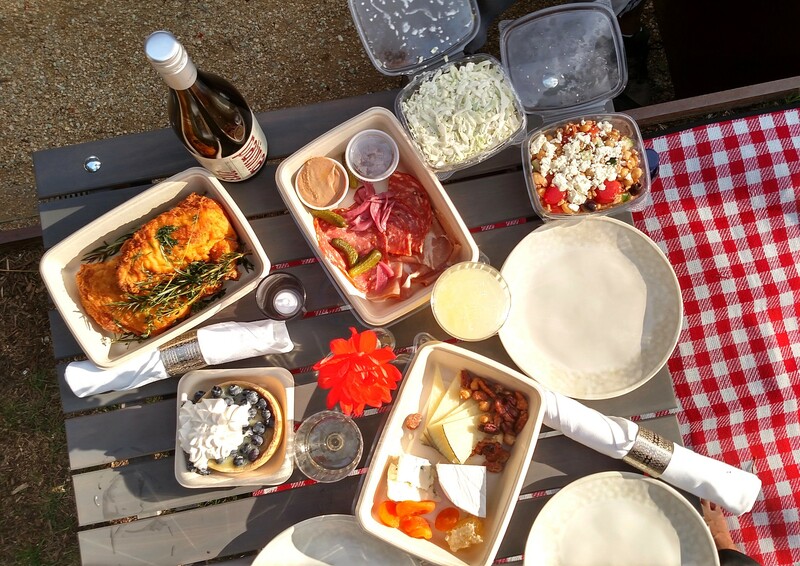 The charcuterie, pates, rillette and cheese are all top-notch. You’ll find your standard selections of meat but also a decent selection of rarer cheeses available to start your evening off on the right foot. 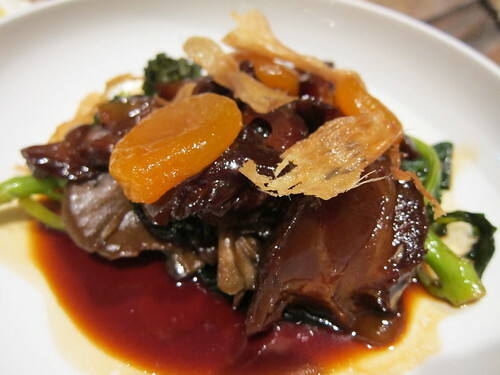 The beef tendon – whether or not you’ve ever particularly been a fan of connective tissue – is a must-order as it stands one of the most tender meat dishes on the menu. 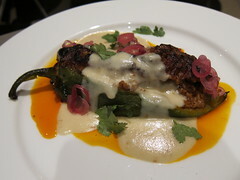 The chile relleno, with its fillings of chorizo, goat cheese, dates and almond sauce, is such a uniquely rich rendition – it’s no wonder the (venison) version Kris left back at District is one of Alan Richman’s top five eats of 2010 in GQ Mag. This is also an essential item in your visit. The flatbreads are no slouch, either, thanks to their wood-fired oven and apricot wood upon which they are cooked and browned. The pie crusts bubble up around the edges and are finished off with that charred crisp only an oven like that can achieve. The combination of toppings are simple (tomato and oregano)Â inspirational (truffle cheese, fontina, mushrooms)Â or plain thematic (goat shoulder and goat cheese). Truth be told, though, the real danger is letting these fill you up and thereby preventing you from exploring the rarer treats on the menu. 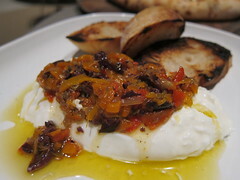 Even their burrata is given a not-so-typical treatment with delicious, savory olive oil and tapenade. And if you’re in the mood for a French classic, theÂ Croque Madame, with itsÂ sunny side up egg on top,Â is cooked to perfection in all its rich glory. You’re best sharing one of these sandwiches unless this eye of the egg is what you particularly crave. And the cocktails…oh, the delicious cocktails. Michel Dozois, whoseÂ cocktails headline Ray’s and Stark Bar and whose Neve Ice keeps said cocktails chilled, said he was given the task of coming up with 100 cocktails yet was able to convince the higher-ups to allow himÂ whittle it down to 25. You will find yourself paging through that still-large selection not able to quite make up your mind and even quite possibly throwing up your hands. No worries, because Michel will be happy to help you discover the cocktail exactly to your liking. It’s not that the recipes are complicated; to the contrary, they’re quite simple. 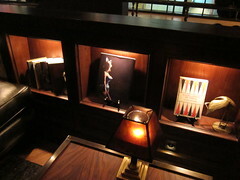 But the selection of spirits, combined withÂ juicesÂ madeÂ in-house, make for some very vibrant cocktails. Even Smokey and the Bandit, which employs Laphroaig, made even the band-aid-ish Islay single malt taste refreshing. If you’re looking for a light, airy treat, try the Morning Glory Fizz – with Scotch, Absinth, egg white, freshly squeezed lemon juice and simple syrup. 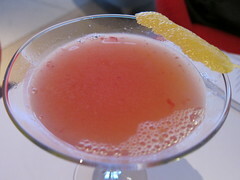 And though I love rye, I wouldn’t have guessed I’d enjoy it with grapefruit juice as in Michel’s Dr. Blinker. If you’re looking for something sweet and spicy, try the Owl and Pussycat, made with rum, freshly squeezed lemon juice, simple syrup, chilis and cherries. Truth be told, there are really just so many cocktails and treats – not to mention mains – to try on this menu. I was just lucky to get a peek. In all, though, it was a great window into what promises to be an interesting and exciting place to explore all the corners of your palate. Art on this block has indeed transcended above and beyond to include the other senses, making the kitchen at Ray’s and Stark Bar an essential and rich (in multiple ways) LACMA experience. All food and cocktails were hosted.